My apologies, Nick Bosa, but you aren’t going No. 1 in this draft. 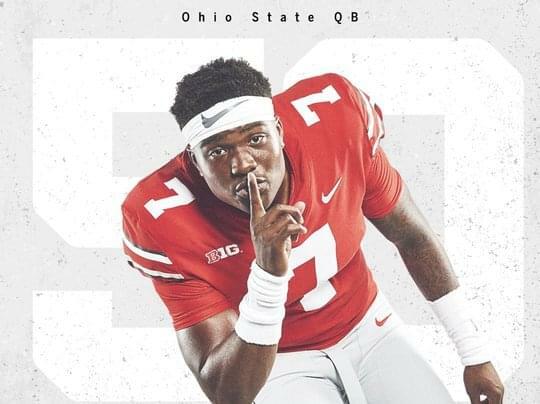 Ohio State quarterback Dwayne Haskins will be the top pick. To secure him, Jaguars personnel chief Tom Coughlin and general manager Dave Caldwell will have to move up to the No. 1 pick in a deal with Arizona. They can’t wait. They can’t hope he falls. If Haskins is your guy, go get him. The Senior Bowl confirmed what many already thought. Haskins is by far the best quarterback prospect in this draft. There is a considerable drop off to Missouri’s Drew Lock, Duke’s Daniel Jones and West Virginia’s Will Grier. I’m not even considering Oklahoma’s Kyler Murray to the Jaguars. I don’t think there’s any chance the Jaguars can get past Murray’s lack of size. The Jaguars hold the seventh pick and face substantial competition in the draft from four other quarterback-needy teams: The New York Giants (sixth pick), Denver (10th), Miami (13th) and Washington (15th). Any of those teams can make a move to get to No. 1. Prior to the 2016 draft, the Rams moved up from 15th to the top spot with Tennessee to select quarterback Jared Goff. Waiting for Haskins to fall isn’t a sound plan. If the Jaguars believe Haskins is a franchise quarterback, they have to move to No. 1. Make the deal with the Cardinals now and then you have a decisive offseason plan that no team can thwart. Let’s go through the cost of acquiring Haskins and how the Jaguars could shape the rest of their offseason activity. The Jaguars would need to send Arizona the following to get Haskins: their first, second and third-rounder in this draft as well as their 2020 first-round pick. The deal works out well for the Cardinals, who ensure Haskins heads to the AFC while remaining in the top seven in the draft order. Arizona would then have three picks in the first 38 selections, five in the first 69 and two first-rounders in 2020. They would also still be in position to draft an outstanding defensive prospect at No. 7. The Jaguars draft class would then include Haskins, the late third rounder acquired from the Rams in the Dante Fowler trade, a fourth rounder, a sixth rounder and two seventh-round picks. A receiver-tight end combo would make the most sense with the first two selections, with right guard and right tackle in play as well. Making the deal now also allows the Jaguars the ability to further hone their free-agent strategy. Haskins becomes the immediate starter, so there is no need to sign a pricey veteran. Cody Kessler (making $900,000 next season) can back up Haskins. The Jaguars are a projected $7.5 million over the 2019 salary cap, according to spotrac.com. However, they can get roughly $34 million under with a roster purge that doesn’t include defensive tackle Marcell Dareus or free safety Tashaun Gipson. Releasing quarterback Blake Bortles and designating it a post-June 1 cut, saves $9.5 million while pushing $5 million in dead money to the 2020 cap. That extra $5 million in savings pays the majority of Haskins’ rookie cap hit (expected to be around $6.2 million) once he’s signed in the summer. The releases of defensive tackle Malik Jackson, right tackle Jeremy Parnell, running back Carlos Hyde and tight end Austin Seferian-Jenkins combined with the $6 million the Jaguars have in roll-over money from this past season gives them substantial relief. The number spikes if Dareus ($10.6 million in savings) or Gipson ($7.5 million) are included in the purge or if other veterans like defensive end Calais Campbell or cornerback A.J. Bouye restructure their contracts to lower their 2019 cap figure. Instead of spending $20 million in 2019 salary on potential free-agent quarterback Nick Foles (a plan I broke down last week), the Jaguars could sign a trio of offensive free agents without breaking the bank. A combination of tight end Jared Cook, receiver John Brown and running back Mark Ingram would likely cost about $20 million total in 2019 cap. The Jaguars can’t wait for Haskins to fall on draft night because if the plan fails, they are out of attractive options. The first wave of free agency will have long since passed by April 25. The Jaguars will find themselves having to settle at quarterback, likely reaching for one at No. 7. The Jaguars are built to compete with a rookie starting at quarterback because the defense will usually keep them in games and the running game still has potential if Leonard Fournette can find his rookie form after an awful second season. Trading for Haskins requires a sacrifice, but if he’s the kind of player that elevates those around him, it will be well worth the price. If Haskins is your guy, Tom, go get him. Go get him now before Arizona makes a deal with the Giants, Broncos, Dolphins or Redskins.